This weekend, we took a quick trip to New Jersey where Howard’s sister Sheryl lives. Also, Howard’s parents were visiting Sheryl for Passover. We hadn’t seen my in-laws since they went to Florida for the winter, and they haven’t met their new grand-dog Bella yet. So, we headed down. Sheryl will be quick to tell you that she doesn’t cook, but she actually does. We always eat very well when we go to visit. I think Sheryl just means she doesn’t do a lot of chopping or dirty a lot of pots. She knows where to buy high-quality ingredients and put them together simply but delicously. That counts as cooking in my book. 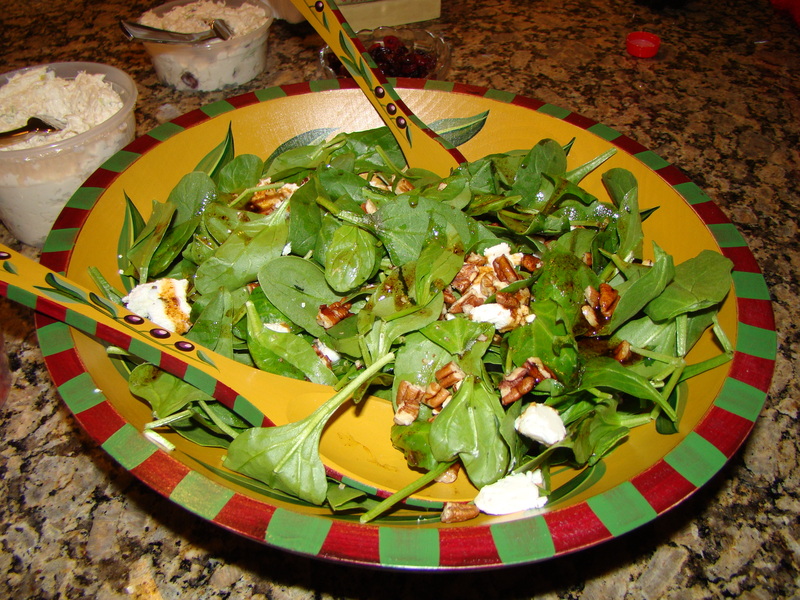 We arrived in time for lunch, and we had a delicious salad: baby spinach, goat cheese, pecans, dried cranberries, and seared tuna. I made a balsamic vinaigrette, and we tossed it all together. It was yummy! Later in the afternoon, the “girls” headed out to check out a tea shop that Sheryl had noticed in her travels. The owner of the Admari Tea Shop in Midland Park really knew her teas. Howard asked me to pick up some green tea to replenish our supply. She let us smell the canisters of teas. I prefer Japanese green tea to Chinese. I learned that Japanese tea leaves are steamed and Chinese is roasted. That must account for the flavor difference. I bought some Matcha Genmaicha, which is green tea powder and green tea mixed with roasted rice, and Honyama Sencha, which is premium tea, shade-grown in the mountains of Japan near Shizuoka. Unfortunately, the shop didn’t have tables to sit and savor a cup, but we each selected a flavor, which she brewed for us to “takeaway”. I tried the Himalayan Delight (a white tea), Sheryl had Java Mate (which was like coffee-flavored tea) and Helyn tried KickAssam (their own special blend). I think we were all pleased with our choices. Before dinner, we had snacks. 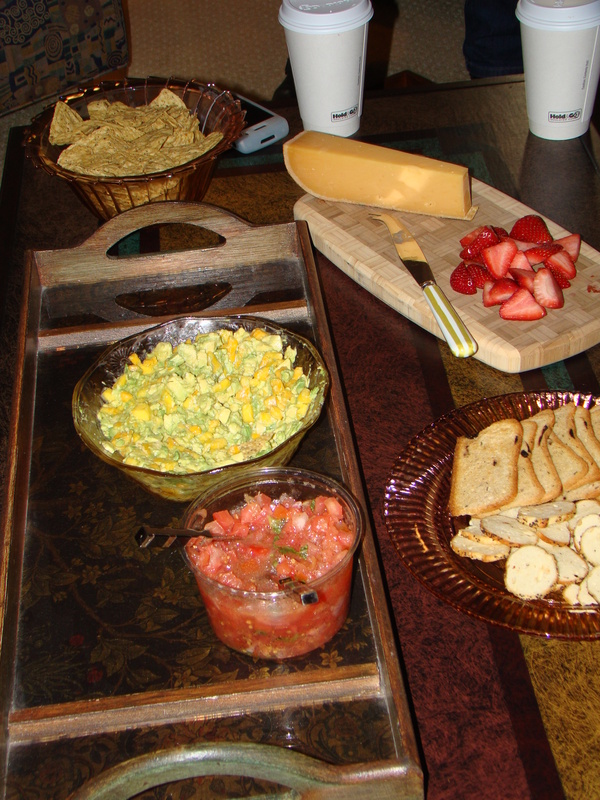 We enjoyed cheese and crackers, fruit, and bruschetta. Howard made his special mango guacamole. Nice spread! Then, as if we needed to eat some more, we had a nice dinner out at an Italian restaurant. an Israeli breakfast dish made with tomato, peppers and poached eggs that they discovered during their recent trip there. It was delicious, and something we’ll try at home. We headed home after breakfast on Sunday. It was a quick visit, but a nice time spent hanging out with family. Also, despite our pre-visit worries, Bella behaved admirably. As I said before, we always eat well at Sheryl’s, even if she says she doesn’t cook. I’m all for seasonal eating. I practice it as best I can. However, life seems cruel when the March and April food magazines arriving in the mail and food websites I’m browsing this week all feature recipes for spring produce like peas, asparagus, rhubarb, and strawberries. We planted peas last weekend, but the harvest time is 65 days. That means I can’t expect to enjoy the first fresh garden peapod until the end of May. While in the garden, I checked out the asparagus bed, but found no sign of green. I also checked the rhubarb, which is just starting to poke up some eyes. And strawberries? Ha! We’re taking June here in Massachusetts, extending into July up in Maine. First up will probably be the mesclun mix we planted. It might be ready in a month. The head lettuce packet says 45 days, so that’s early May. I know that no other “spring” fruits or vegetables, at least ones grown here, will be available locally for a while, but I sure can’t wait! On a positive note, the flower beds are full of activity. I can see leaves popping up from many of my bulbs, but, so far, blooms only on the snowdrops (for a while now) and crocus. Hyacinth, daffodil, and muscari have yet to show their colors. The perennials are arriving quickly. I see the first leaves of so many plants coming out to say hello to spring. There are day lilies, poppies, sedum, bleeding hearts, columbine, iris, valarian, Pasque flower, a few millimeters more each day. Also, last night when I was walking Bella, I heard the peepers for the first time this year. That is also an encouraging sign. 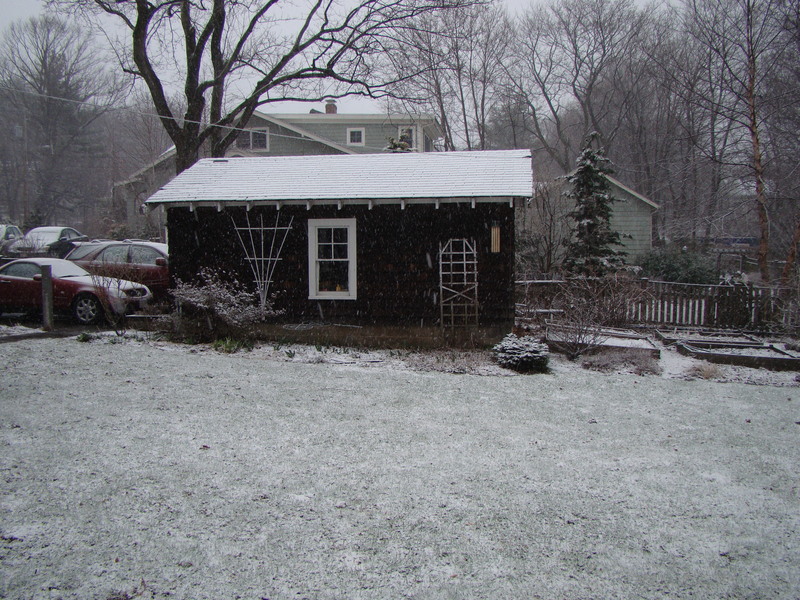 I’ll end on a humorous note: it was snowing this morning! But it was gone in the afternoon.